It will also work for Tomcat 6.x. We'll install the JDK, Tomcat, create a start/stop script, and configure Tomcat to run as a service and start at boot. 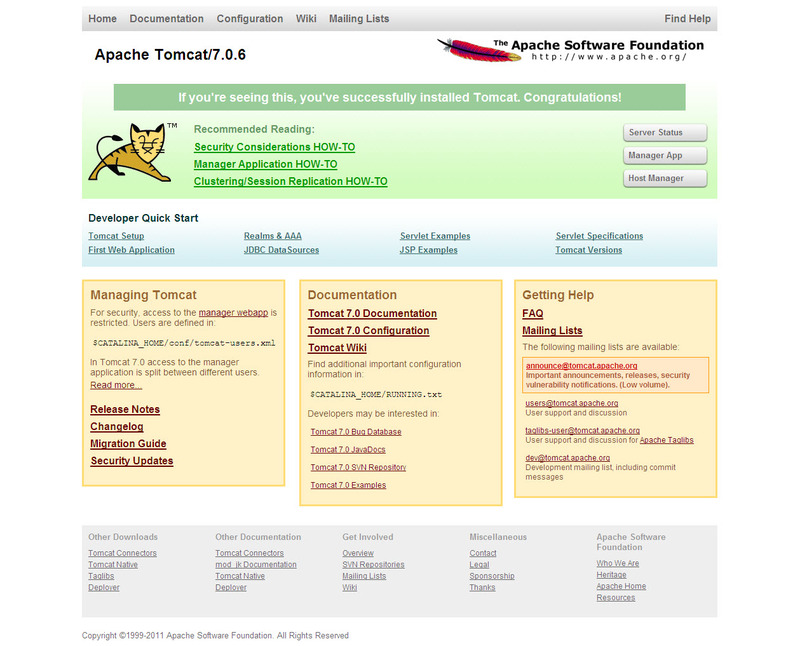 For this installation, we'll use Tomcat 7.0.14, the current release of Tomcat 7. JDK 1.6 is the minimum JDK version required for Tomcat 7. We'll use the latest, JDK 6 Update 25. The JDK is specific to 32 and 64 bit versions. Download the JDK and save it to a directory. I'm saving it to /opt. Set the JAVA_HOME path to the location we installed our JDK above. Step 3: Configuring Tomcat to Run as a Service. We will now create a simple Start/Stop/Restart script and configure Tomcat to run as a service. We will also configure Tomcat to start at boot. Change to the /etc/rc.d directory and create a script called 'tomcat' as shown below. In the above script, we are simply calling the startup.sh and shutdown.sh scripts located in the Tomcat bin directory (/usr/share/apache-tomcat-7.0.14/bin). You should review the Catalina.out log located at /usr/share/apache-tomcat-7.0.14/logs/catalina.out and check for any errors. your post is very good. i made all instructions on the slack 13.37, but it´s not accepting unless root login. i made all instructions above on the slackware 13.37, but it´s not accepting unless root logged.